Map of the westernmost eight counties in North Carolina. The 2004 proposal for Interstate 3 outlined a corridor between Knoxville, Tennessee and Augusta, Georgia. Plans called for the freeway to follow portions of North Carolina 69, U.S. 64, and U.S. 129 through Clay, Cherokee and Graham Counties. Astronomical costs and environmental impacts have precluded this route from moving forward. Bound by the state borders of Georgia, South Carolina, and Tennessee, Western North Carolina encompasses the high country of the Appalachian Mountains. Home to Great Smoky Mountains National Park and the Pisgah and Nantahala National Forests, this area of the state is home to a number of rustic towns, majestic peaks, and various lakes for boating enthusiasts. Interstate 40 is the main highway from Knoxville and eastern Tennessee to Asheville and the rest of North Carolina. The four-lane freeway cuts through the heart of Haywood County between Great Smoky Mountains National Park and Canton. Interchanges connect with local roads within the Pisgah National Forest, the Great Smoky Mountain Expressway near Waynesville, and at Canton. Interstate 40 travels just ten miles from the Haywood County line to the city of Asheville. Rock slides are a problem along Interstate 40 periodically. Closures of the freeway occurred on December 21, 2012 near mile marker seven for three days, on January 31, 2012 near Exit 20 for two weeks, and from October 25, 2009 to April 27, 2010 at the Tennessee state line. U.S. 74 enters the state of North Carolina paired with U.S. 64 from Isabella, Tennessee at the far western corner of the state. The U.S. routes overlap along a four-lane divided highway from there to Ranger, where they join U.S. 19 & 129. All four routes then travel northeast to Murphy, where U.S. 64 leaves for Hayesville. U.S. 19 & 74 continue with U.S. 129 to Andrews and Topton, where U.S. 129 departs for Sunteetlah Lake. U.S. 74 lines three portions of the Great Smoky Mountains Expressway. The first segment bypasses Bryson City and Ela to the south of U.S. 19. The second segment carries U.S. 23 & 74 north of Sylva. The final segment includes overlaps with both U.S. 19 & 23 as it bypasses Waynesville between Hazelwood and Interstate 40. All Great Smoky Mountains Expressway segments are signed with exit numbers based upon U.S. 74’s mileage from the Tennessee state line. U.S. 19 travels more east-west than north-south through western North Carolina. The U.S. highway flows northward out of the Atlanta metropolitan area into the North Georgia Mountains before crossing the state line along side U.S. 129 near Ranger. Four miles beyond the state line, U.S. 19 & 129 merge with U.S. 64 & 74 for a seven-mile overlap to Murphy. Once at Murphy, U.S. 19 Business loops into town and U.S. 64 leaves for Hayesville and Franklin. U.S. 19-29-129 continue 28 miles to Topton, where U.S. 129 departs for Robbinsville. A U.S. 19 Business loop serves the town of Andrews midway between Ranger and Topton. Beyond the split with U.S. 129, U.S. 19 & 74 continue along a two-lane roadway through Nantahala, Wesser and the southern reaches of Fontana Lake. U.S. 19 partitions with U.S. 74 at the west end of the Great Smoky Mountain Expressway at Bryson City. The U.S. highway provides the main route through town en route to Ela, Birdtown and the resort town of Cherokee. Cherokee lies just south of Great Smoky Mountains National Park within the Cherokee Indian Reservation. U.S. 19 shares a short stretch with U.S. 441 through town before exiting onto winding path through Soco Gap to Maggie Valley. 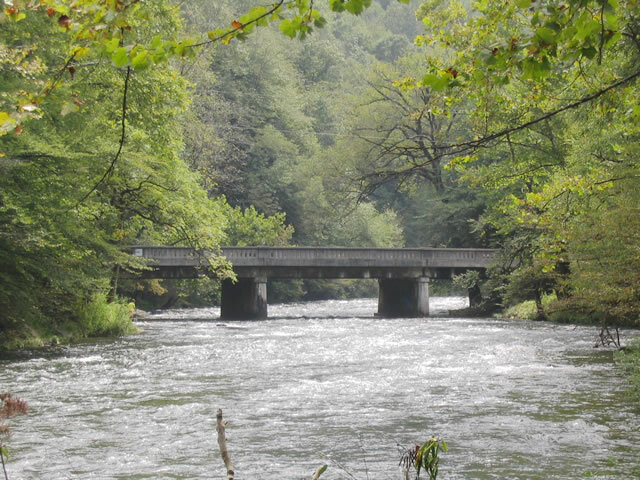 An older concrete bridge carries U.S. 19 & 74 across the Nantahala River between U.S. 129 at Topton and Nantahala Gorge. Photo taken by Carter Buchanan (09/12/04). The narrow nature of U.S. 19 continues from Cherokee through to Maggie Valley. The winding roadway is not recommended for trucks and a U.S. 19 Truck bypass is signed for U.S. 441 and U.S. 74 to the south. At Maggie Valley the U.S. route widens into a four-lane divided highway as U.S. 19 descends into Dellwood (U.S. 276) and Waynesville. A brief jog along the Great Smoky Mountain Expressway carries U.S. 19 around Waynesville to Canton. U.S. 19 & 23 depart U.S. 74 ahead of its merge with Interstate 40 to pass through downtown Clyde and Canton. U.S. 23 is cosigned throughout its course through Western North Carolina. The route enters the state from Dillard, Georgia along side U.S. 441 via a four-lane divided highway. 14 miles north of the state line, the pair merge with U.S. 64 around the Macon County seat of Franklin. U.S. 23 & 441 share two miles with U.S. 64 before resuming a northward trajectory to Dillsboro and U.S. 74. U.S. 441 parts ways with U.S. 23 for U.S. 74 west to Cherokee as U.S. 23 joins U.S. 74 east by Sylva. U.S. 23 Business loops south into Sylva while the Great Smoky Mountains Expressway bypasses the city to the north. U.S. 23 & 74 overlap through to their merge with U.S. 19 at Waynesville. Once at Exit 106, U.S. 19 & 23 split with U.S. 74 for Clyde and Canton as U.S. 74 continues onto Interstate 40. A U.S. 23 Business loop serves Downtown Waynesville between Hazelwood and Clyde. West – Clay Co. Ranger. U.S. 64 comprises the longest route within the state of North Carolina. Traveling over 600 miles, U.S. 64 crosses the state from the Tennessee state line to Nags Head on the Outer Banks. Entering North Carolina with U.S. 74, U.S. 64 ventures 16 miles from Isabella, Tennessee to Ranger. Just east of there U.S. 64 & 74 join U.S. 29 & 129 for a seven mile drive to the Cherokee County seat of Murphy. U.S. 64 leaves U.S. 29-74-129 at Murphy to skim the southern reaches of Clay, Macon, Jackson and Transylvania Counties. This includes a 2009-realignment from Murphy east to North Carolina 141. The winding route travels to Hayesville, Chatuge Lake, Shooting Creek and Rainbow Springs on the route between Murphy and Franklin (U.S. 23 & 441). U.S. 64 merges briefly with U.S. 23 & 441 to bypass Franklin to the south. A U.S. 64 Business loop also serves Hayesville. Once outside of Franklin, U.S. 64 reduces to two lanes and heads southeasterly again to Highlands along side North Carolina 28. North Carolina 28 departs there for Pine Mountain, Georgia as U.S. 64 turns back to the northeast to Cashiers, Sapphire and Cherryfield. U.S. 64 meets the northern terminus of U.S. 178 in central Transylvania County near the town of Rossman. Nine miles separate U.S. 178 and the Transylvania County seat of Brevard along a four-lane divided stretch of U.S. 64. The highway, in conjunction with North Carolina 280, provides a direct route to Interstate 26 and the Asheville metropolitan area to the northeast. U.S. 64 joins U.S. 276 for a three-mile overlap between Downtown Brevard and North Carolina 280 before turning eastward to Etowah and Hendersonville. Through Brevard, a U.S. 64 Truck route follows Caldwell Street one block north of U.S. 64 (Broad Street). A longer U.S. 64 Truck follows U.S. 74 and Interstate 40 between Hendersonville and Murphy. U.S. 129 skims the western two counties of North Carolina between Ranger and Tapoco. The highway overlaps with U.S. 19 north from the Georgia line to U.S. 64 & 74 outside of Ranger. Turning northeast from there, U.S. 129 takes a divided highway with U.S. 19 & 74, 25 miles between Ranger and Andrews. Once at Topton, U.S. 129 leaves U.S. 19 & 74 to the northwest through the Sunteetlah Lake region en route to Maryville and Knoxville, Tennessee. U.S. 178 extends just seven miles into the Tar Heel State. The US Route begins at U.S. 64 outside of Rossman and travels southward to Rocky Bottom and Pickens, South Carolina. The scenic two lane highway encircles Sassafras Mountain, the tallest peak in the Palmetto State. Like U.S. 178, U.S. 276 is a Carolina-only U.S. route. U.S. 276 however is much shorter than U.S. 178, as it only travels between Greenville, South Carolina and Cove Creek, North Carolina. The route serves the growing northern suburbs of Greenville before ascending to Caesars Head, South Carolina and Cedar Mountain, North Carolina. Like U.S. 178 to the west, the route navigates through numerous switchbacks and sharp curves as it traverses the high country across the state line. U.S. 276 joins U.S. 64 for a three mile overlap out of Brevard. The two partition at the northbound beginning of North Carolina 280. U.S. 64 travels to Hendersonville, North Carolina 280 to Asheville, and U.S. 276 to Waynesville. Including several switch backs and sharp curves, U.S. 276 winds through Pisgah National Forest on the 30 mile drive to Woodrow. Points of interest along the route include the natural attractions of Sliding Rock and Looking Glass Falls. Once outside the Pisgah National Forest, U.S. 276 intersects the south end of North Carolina 110 in Woodrow, and North Carolina 215 north of Sunburst. A seven mile drive from there brings U.S. 276 to Downtown Waynesville and U.S. 23 Business (Main Street). U.S. 276 travels a four-lane divided highway from Waynesville to U.S. 19, where the two merge together for two miles. North from Dellwood, U.S. 276 enters its final extant between U.S. 19 and Interstate 40 at Cove Creek. U.S. 276 (Main Street) eastbound, two blocks south of the U.S. 64 overlap along Broad Street in Brevard. The signalized intersection is with Main and Johnson Streets in Downtown. Photo taken 07/23/04. U.S. 276 east transitions from Main Street to Greenville Highway at the intersection with Park Avenue east of Downtown Brevard. Greenville Highway is named for the U.S. 276 connection between Brevard and Greenville, South Carolina. Photo taken 07/23/04. The last traffic signal along U.S. 276 eastbound within the state of North Carolina. Intersecting the highway here is Parkview Drive and SR-1543. Greenville Highway departs the city of Brevard after the intersection with Gallimore Road ahead. Photo taken 07/23/04. Scenes along U.S. 276 (Greenville Highway) eastbound through the Dunns Rock and Cedar Mountain area of south Transylvania County. Initially the route plies across flat farmland south of Brevard before ascending into the mountains near the state line. The winding roadway navigates through many switchbacks and undulations on the 22-mile drive between Brevard and South Carolina 11. Photos taken 07/23/04. U.S. 441 enters North Carolina with U.S. 23 near Norton in southern Macon County as a four-lane divided highway. U.S. 23 & 441 combine from there 35 miles north to Dillsboro and the Great Smoky Mountain Expressway. The tandem bypasses Franklin along a two-mile overlap with U.S. 64 in central Macon County. U.S. 441 Business loops into Downtown Franklin north of the U.S. 23-64-441 bypass. Outside of Sylva, U.S. 441 switches from the overlap with U.S. 23 to an overlap with U.S. 74. U.S. 74 & 441 wind eight miles northwest to the Bryson City segment of the Great Smoky Mountain Expressway at Exit 74. There U.S. 441 finally maintains its own routing to Cherokee. Through Cherokee, the highway splits between a business and bypass routing. U.S. 441 Business branches northeast to U.S. 19 at Cherokee. U.S. 441 Bypass stays west and joins U.S. 19 briefly before merging with U.S. 441 Business west of town. U.S. 441 leaves Cherokee for Smokemont and Great Smoky Mountains National Park. Not open to commercial traffic, the US highway is the only to travel across the Great Smoky Mountains between North Carolina and Tennessee. The 25-mile drive between Smokemont and Gatlinburg, Tennessee features scenic views from the summit near the state line. Generally, the route geometry does not allow for high speeds. North Carolina 215 (Blackwell Drive) northbound at SR-1643 in the town of Canton. The state route turns left onto SR-1643 for the drive to Interstate 40 & U.S. 74 north of town. North Carolina 215 and Newfound Road provide the main access points to I-40 from Canton and West Canton. Photo taken 09/12/04. Northbound N.C. 215 at the diamond interchange (Exit 31) with Interstate 40 & U.S. 74. The state route ends here opposite SR-1582. There is no outlet to the system of roads north of the exchange. Photo taken 09/12/04. SR-1188 / Spring Street northbound at U.S. 19 (Main Street) in Bryson City. U.S. 19 takes Main Street west along the banks of the Tuckasegee River to Spring Street, where it shifts north for two blocks. U.S. 19 turns back west along Alarka Road from Spring Street before crossing the Tuckasegee River along Slope Street. Photo taken 09/12/04. Everett Street southbound at the Great Smoky Mountain Railroad crossing and Depot Street in Downtown Bryson City. Everett Street crosses the Tuckasegee River in three blocks to meet U.S. 19 (Main Street). Photo taken 08/12/04. SR-1375 constitutes the westbound frontage road of the Great Smoky Mountain Expressway in the vicinity of Exit 104. The roadway carries U.S. 23 Business and North Carolina 209 traffic onto U.S. 19 & 23 south and 74 westbound for Maggie Valley, Cherokee, and Bryson City. Photo taken 08/12/04. Page Updated January 30, 2013.